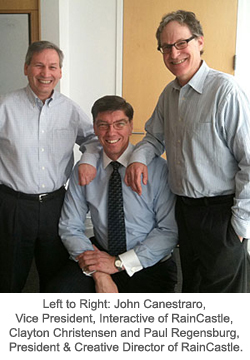 Clayton Christensen: Applying the Theory of "Jobs-to-be-Done"
RainCastle is pleased to be collaborating with Harvard Business School professor, Innosight cofounder, and disruptive innovation pioneer Clayton Christensen to create his new website, to be launched in May. The web design process incorporates Clay's famous "Jobs-to-be-done" theory. Briefly, the premise of jobs-to-be-done is that rather than inquiring of a client or prospect about what product or service they want to buy, the more important questions are "What problem do they need to solve?" or "What is the job they need to have done?" And which product or service should they "hire" to do the job? For businesses trying to understand their customers' motivations, employing the jobs-to-be-done concept causes them to look beneath the surface at what the customer is trying to accomplish — instead of toward the expected end product. The result is a product or service that addresses a customer's true motivations rather than a preconceived notion. In taking a jobs-to-be-done approach to Clay's website, we're not looking ahead at how to fill a 50-page website with lots of video, plenty of pictures of Clay and the coolest interactive tools and techniques. Instead, the job-to-be-done is to relate the value and impact of Clay's thinking to a global online audience. The form of the website will follow the function. What is the situational context driving a visitor to Clay's website, i.e., what need is that visitor seeking to fulfill? What content will motivate people to visit the site and return time and again? What are the emotional drivers for people coming to the site? How can they interact with the site to fulfill those needs? What are the impediments that make the sites of some other great thinkers unsatisfying? The answers to these questions will form the blueprint of our job-to-be-done. In breaking it down this way, I feel very comfortable in this approach since my own design training utilized a strong "form follows function," Bauhaus influence, which has similarities. How do you think the jobs-to-be-done idea applies to your website and marketing? Stay tuned for our launch of Clayton Christensen's website in late Spring!